There really is no season more swoon-worthy than spring. From the moment those first ambitious and brave little green shoots burst forth from the cold, just-thawed soil, I'm starry-eyed with love for this planet. There really is no greater time in the garden than when the new growth is bright green and fresh, unmarred by pest and not yet wilted by long hot summer days. The delight I feel from those first vibrant spring blooms is completely unparalleled by anything that will flower later in the season—I actually roam the neighbourhoods just to ogle other gardens in bloom and have caught myself more than once sighing out-loud like a teenager in love. After many months of being cooped up indoors I cannot wait to get out in the garden and set up twinkly lights and potted ferns and all the fixings required to maximize the fabulous (but fleeting) al fresco living to come. You may mistakenly feel that a small city garden is no place for a hammock. I say PSHAW to that. 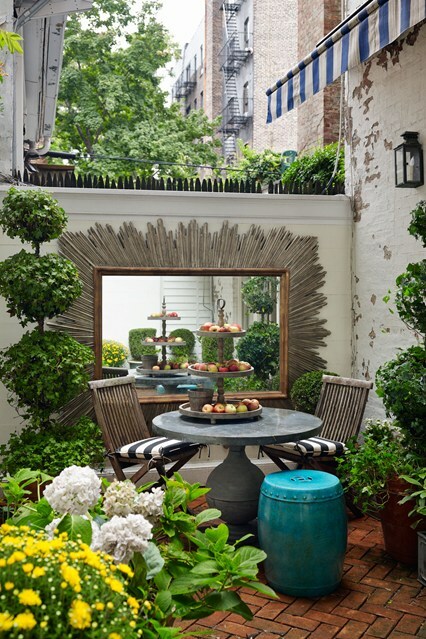 This diminutive garden is made to look larger than it is with the addition of mirrored trellis. No trees? NO problem. Stretch a hammock on a frame, distract the eye with pillows and tassels and twinkly lights. Look how gorgeous! Don't let a tiny space keep you from laying it on thick. I mean throw pillows, floor pillows, carpets, mismatched planters overflowing with greens. Even if your indoor tastes lean more toward a tailored taste, summer is the time to let go a little and just surround yourself with colour, texture and a riot of life. Treat your small garden, patio or deck as an intimate space, not a limited one. Like, literally. Even those of us with a black thumb can grow greenery. Hostas, ferns, vines, grasses and many varieties of green bushes are perennial (so they come back year after year) and practically grow themselves. In pots AND gardens. Flowers are often more finicky, attracting pests and providing feasts for your local squirrels. 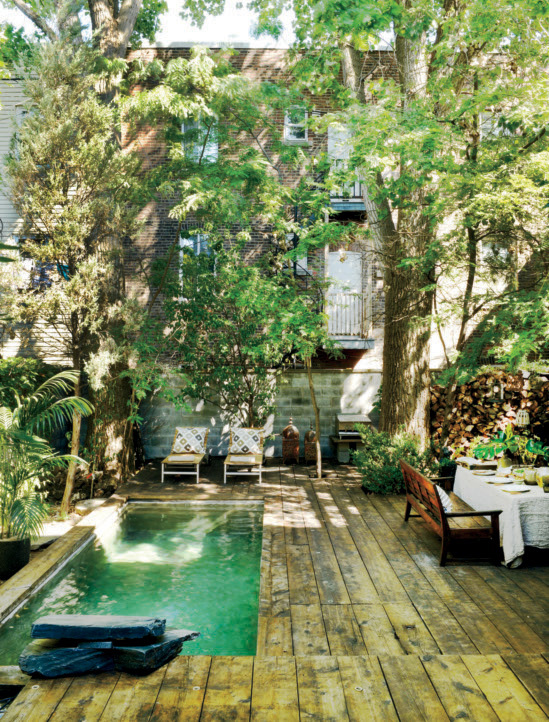 A lush, green yard is always chic and will never ever go out of style. Here at EMME Design we always love us some vintage. But in the garden? EVEN BETTER. Outdoor furniture can be expensive and bulky and difficult to source, especially for small outdoor spaces, decks and porches. Hit your local garage sales, Kijiji, neighbour's garbage (whatever, we've ALL done it) and scavenge your way to a gorgeous garden. 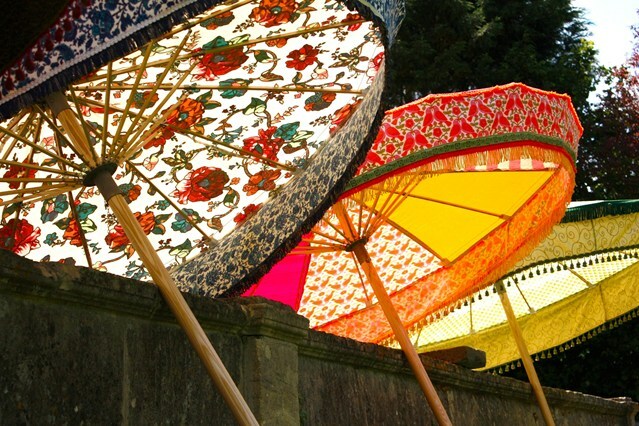 You can fluff with new accessories—though really I can't EVEN with these parasols covered in vintage fabric. Add ample candle light and honestly, your space will feel cosier than it ever would with one of those (gasp) expensive and matchy big box patio sets. Be it a tiny terrace, wee enclosed courtyard or bitty balcony—never let size deter you from your mission. Maximize that space and use it to its full advantage during the warm months. Play up the surfaces you've been dealt. The peeling brick wall on the New York City terrace above becomes a thing of beauty when paired with towering ivy topiaries (think tall, grow upwards!) and charming accessories. The large-scale mirror creates the illusion of doubling the space. If you can, and I know that not all of us can, a water feature is a major mood enhancer in any sized outdoor space. Be it a small burbling fountain or a petite plunge pool (dreams) you will take your space up quite a notch by introducing this element of nature in amidst your air, earth and fire. Need a little help creating your own outdoor oasis this season? We'd love to help decorate your space. Give us a call!